Do you ever get a lie on the course you’re not sure how to approach? Join us at our Short Game Spring Training class, and we will cover any short game questions you may have such as side hill, buried, fluffy or tight lies. You will learn how to use your wedges to their maximum potential. With simple effective information and practice drills, you will be able to conquer all of these tricky shots. 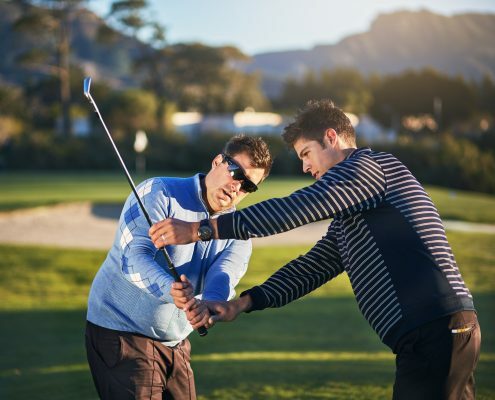 If you’re ready to improve your golf game and enjoy your time on the course, invest in quality golf instruction with Kyle Larson, Assistant Golf Professional. Kyle believes in an understanding of the fundamentals including posture, grip, and alignment. He uses video as a tool for swing analysis, development of personalized practice plans, and progress tracking to help you achieve your goals. Kyle offers private lessons focused on the fundamentals, 9-hole playing lessons focused on course management, club selection, and routine, and group lessons for up to three people. For more information contact Kyle Larson via email or at 360.895.0130.